usually put up, and I was concerned about copyright, but found nothing on the original website where this was published that says I can’t do it…… and I expect no one at resilience.org objects to ensuring the spread of this important message. Five years ago, I published a very short item on roughly the same concept. 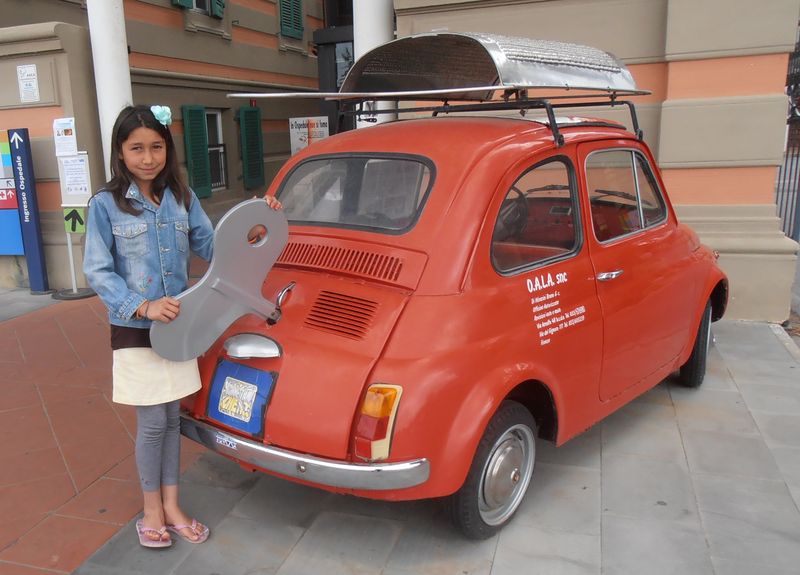 But I’m no Ugo Bardi….. So make yourself a good cuppa your favourite poison, and enjoy…. So, ladies and gentleman, let me start with this recent book of mine. 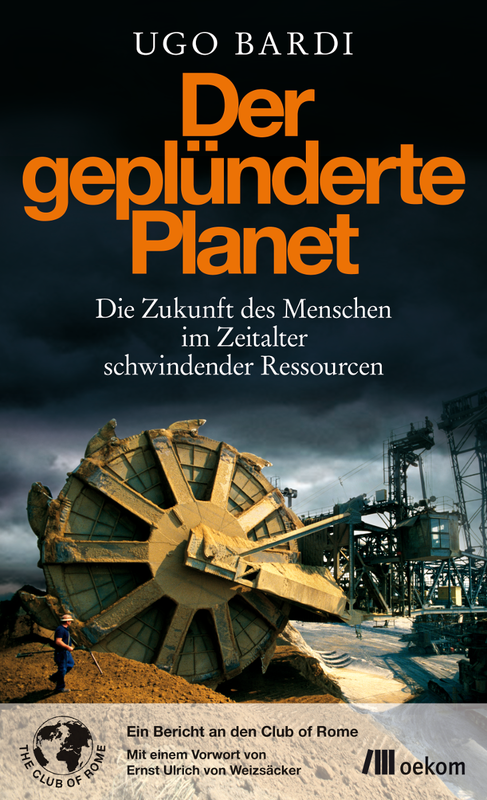 It is titled “The Plundered Planet.” You can surely notice that it is not titled “The Developed Planet” or “The Improved Planet.” Myself and the co-authors of the book chose to emphasize the concept of “Plundering”; of the fact that we are exploiting the resources of our planet as if they were free for us for the taking; that is, without thinking of the consequences. And the main consequence, with which we are concerned here is called “depletion,” even though we have to keep in mind the problem of pollution as well. Now, there have been many studies on the question of depletion, but “The Plundered Planet” has a specific origin, and I can show it to you. Here it is. It is the rather famous study that was published in 1972 with the title “The Limits to Growth”. It was one of the first studies that attempted to quantify depletion and its effects on the world’s economic system. It was a complex study based on the best available data at the time and that used the most sophisticated computers available to study how the interaction of various factors would affect parameters such as industrial production, agricultural production, population and the like. Here are the main results of the 1972 study, the run that was called the “base case” (or “standard run”). The calculations were redone in 2004, finding similar results. As you can see, the results were not exactly pleasant to behold. 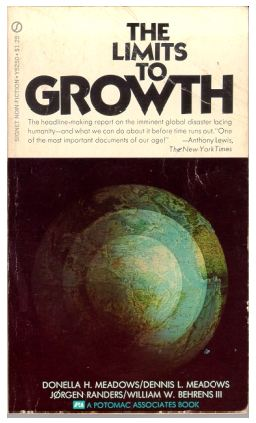 In 1972, the study saw a slowdown of the world’s main economic parameters that would take place within the first two decades of the 21st century. I am sure that you are comparing, in your minds, these curves with the present economic situation and you may wonder whether these old calculations may be turning out to be incredibly good. 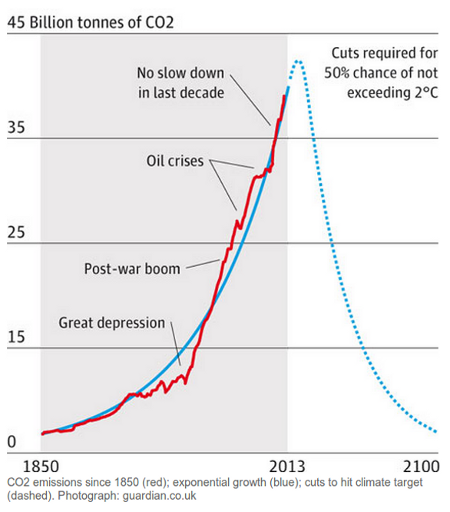 But I would also like to say that these curves are not – and never were – meant to be taken as specific predictions. No one can predict the future, what we can do is to study tendencies and where these tendencies are leading us. 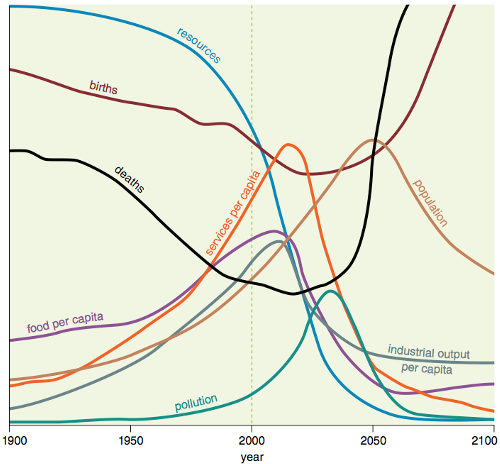 So, the main result of the Limits to Growth study was to show that the economic system was headed towards a collapse at some moment in the future owing to the combined effect of depletion, pollution, and overpopulation. Maybe the economic problems we are seeing nowadays are a prelude to the collapse seen by this model, maybe not – maybe the predicted collapse is still far away in the future. We can’t say right now. In any case, the results of the study can be seen at least worrisome. And a reasonable reaction when the book came out in 1972 would have been to study the problem in greater depth – nobody wants the economy to collapse, of course. But, as you surely know, the Limits to Growth study was not well received. It was strongly criticized, accused of having made “mistakes” of all kinds and at times to be part of a worldwide conspiracy to take control of the world and to exterminate most of humankind. Of course, most of this criticism had political origins. It was mostly a gut reaction: people didn’t like these results and sought to find ways to demonstrate that the model was wrong (or the data, or the approach, or something else). If they couldn’t do that, they resorted to demonizing the authors – that’s nothing now; I described it in a book of mine “Revisiting the limits to growth“. I am showing you these equations just to let you note how these systems can be described by a set of correlated differential equations. 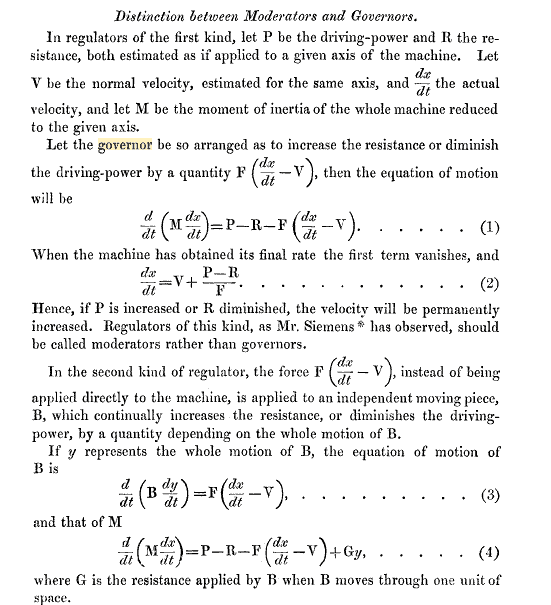 It is an approach that is still used and today we can solve this kind of equations in real time and control much more complex systems than steam engines. For instance, drones. 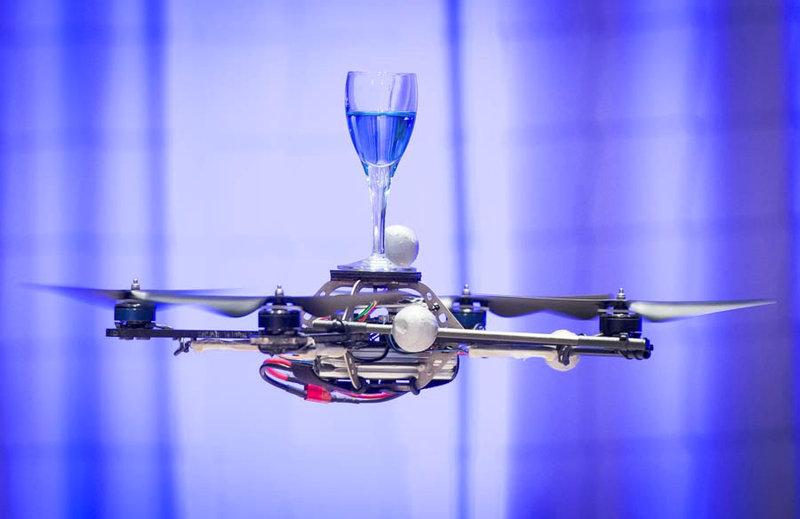 You see here that a drone can be controlled so perfectly that it can hold a glass without spilling the content. And you can have drones playing table tennis with each other and much more. Of course they are also machines designed for killing people, but let’s not go into that. The point is that if you can solve a set of differential equations, you can describe – and also control – the behaviour of quite complex systems. 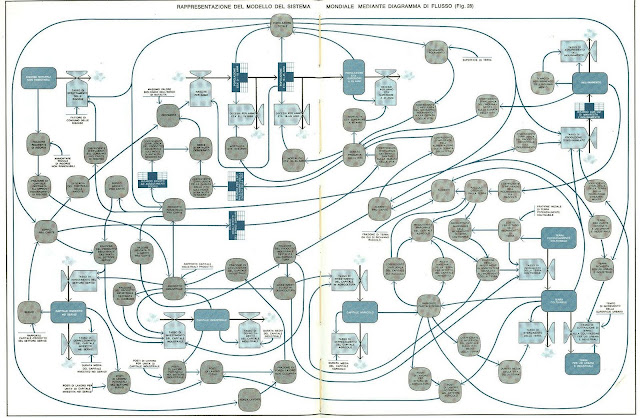 System dynamics is something that was developed mainly by Jay Wright Forrester in the 1950s and 1960s, when there started to exist computers powerful enough to solve sets of coupled differential equations in reasonable times. That generated a lot of studies, including “The Limits to Growth” of 1972 and today the field is alive and well in many areas. On the right you have a representation of the real system, a bathtub partly filled with water. 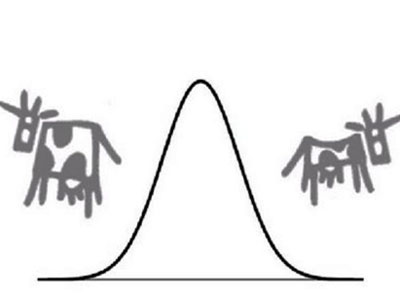 On the left, its representation using system dynamics. These models are called “stock and flow”, because you use boxes to represent stocks (the quantity of water in the tub) and you use double edged arrows to indicate flows. The little butterfly like things indicate valves and single edged arrows indicate relationship. The model on the left is not simply a drawing of box and arrows, it is made with a software called “Vensim” which actually turns the model “alive” by building the equations and solving them in real time. And, as you may imagine, it is not so difficult to make a model that describes a bathtub being filled from one side and emptied from the other. But, of course, you can do much more with these models. 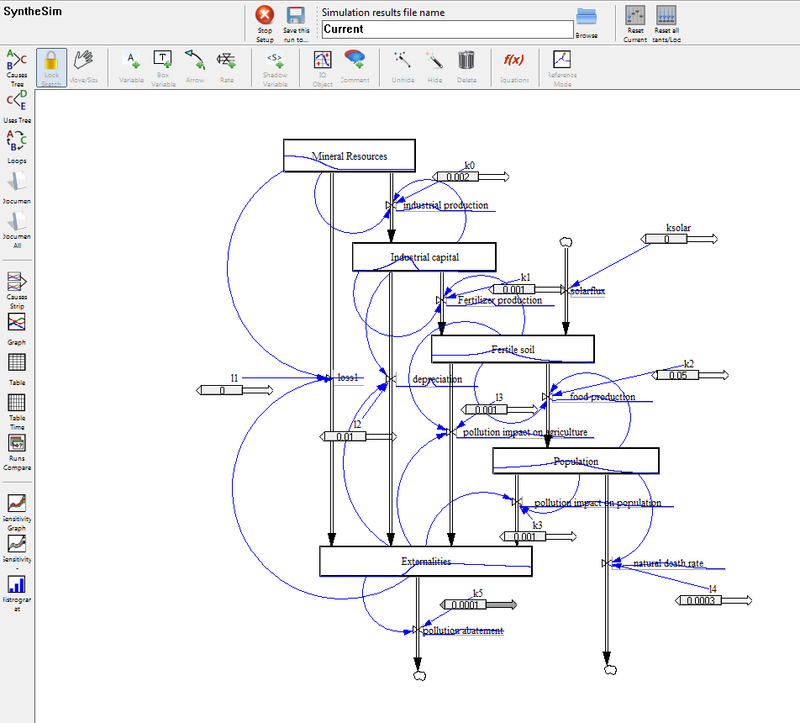 So, let me show a model made with Vensim that describes the operation of a governor and of the steam engine. Before we go on, let me introduce a disclaimer. This is just a model that I put together for this presentation. It seems to work, in the sense that it describes a behaviour that I think is correct for a governor (you can see the results plotted inside the boxes). But it doesn’t claim to be a complete model and surely not the only possible way to make a system dynamics model of a governor. This said, you can give a look to it and notice a few things. 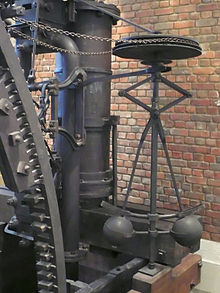 The main one is that we have two “stocks” of energy: one for the large wheel of the steam energy, the other for the small wheel which is the governor. In order to provide some visual sense of this difference in size, I made the two boxes of different size, but that doesn’t change the equations underlying the model. 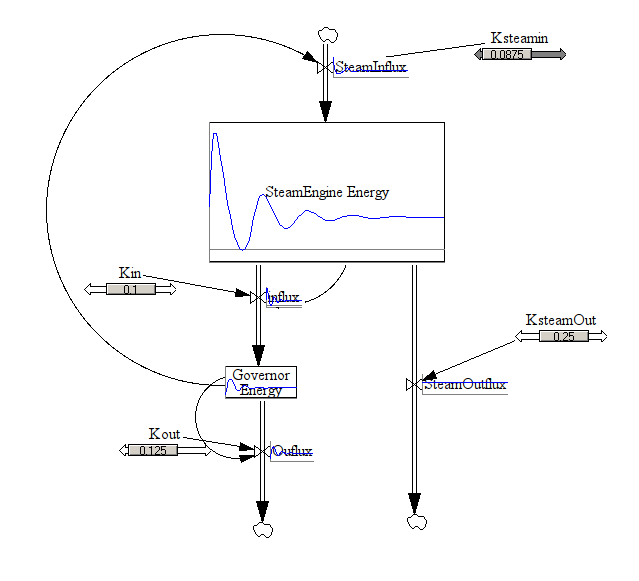 Note the “feedback”, the arrows that connect flows and stock sizes. The concept of feedback is fundamental in these models. It is, again, a model based on thermodynamics and, this time, driven by chemical potentials. The idea is that the “resources” stock as a high chemical potential in the sense that it may be thought as, for instance, crude oil, which spontaneously combines with oxygen to create energy. This energy is used by human beings to create what I can call “capital” – the sum of everything you can do with oil; from industries to bureaucracies. On the right, you can see the results that the model provides in terms of the behaviour as a function of time of the stock of the resources, their production, and the capital stock. You may easily notice how similar these curves are to those provided by the more complex model of “The Limits to Growth.” So, we are probably doing something right, even with this simple model. This is the case of whaling in 19th century, when whale oil was used as fuel for lamps, before it became common to use kerosene. I am showing you this image because it is the first attempt I made to use the model and I was surprised to see that it worked – and it worked remarkably well. 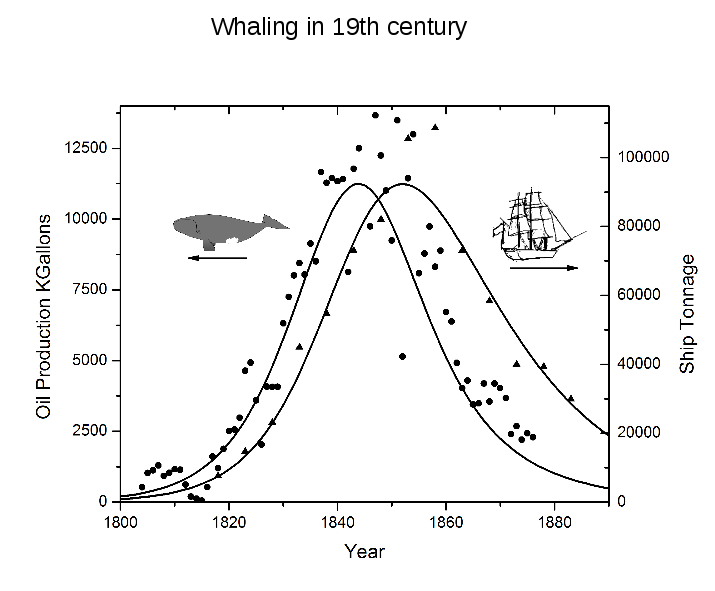 You see, here you have two stocks: one is whales, the other is the capital of the whaling industry that can be measured by means of a proxy that is the total tonnage of the whaling fleet. And, as I said, the model describes very well how the industry grew on the profit of killing whales, but they killed way too many of them. Whales are, of course, a renewable resource; in principle. But, of course, if too many whales are killed, then they don’t have enough time to reproduce and they behave as a non-renewable resource. Biologists have determined that at the end of this fishing cycle, there were only about 50 females of the species being hunted at that time. Non renewable, indeed! So, that is, of course, one of the several cases where we found that the model can work. Together with my co-workers, we found that it can work also for petroleum extraction, as we describe in a paper published in 2009 (Bardi and Lavacchi). But let me skip that – the important thing is that the model works in some cases but, as you would expect, not in all. And that is good – because what you don’t want is a “fit-all” model that doesn’t tell you anything about the system you are studying. Let’s say that the model reproduces what’s called the “Hubbert model” of resource exploitation, which is a purely empirical model that was proposed more than 50 years ago and that remains a basic one in this kind of studies: it is the model that proposes that extraction goes through a “bell-shaped” curve and that the peak of the curve, the “Hubbert peak” is the origin of the concept of “peak oil” which you’ve surely heard about. Here is the original Hubbert model and you see that it has described reasonably well the production of crude oil in the 48 US lower states. You see that I added a third stock to the system. In this case I called it “pollution”; but you might also call it, for instance, “bureaucracy” or may be even “war”. It is any stock that draws resource from the “Capital” (aka, “the economy”) stock. And the result is that the capital stock and production collapse rather rapidly; this is what I called “the Seneca effect”; from the roman philosopher Lucius Anneaus Seneca who noted that “Fortune is slow, but ruin is rapid”. For this model, I can’t show you specific historical cases – we are still working on this idea, but it is not easy to make quantitative fittings because the model is complicated. But there are cases of simple systems where you see this specific behaviour, highly forward skewed curves – caviar fishing is an example. But let’s not go there right now. Now, another disclaimer: I am not saying that this model is equivalent to that of the Limits to Growth, nor that it is the only way to arrange stocks and flows in order to produce similar results to the one obtained by the Limits to Growth model. It is here just to show to you the logic of the model. And I think you can agree, now, that there is one. The “Limits” model is not just randomly arranged spaghetti, it is something that has a deep logic based on thermodynamics. It describes the dissipation of a cascade of thermodynamic potentials. The curve may be skewed forward or not, but that changes little on the fact that the downside slope is not so pleasant for those who live it. Don’t expect this curve to be a physical law; after all it depend on human choices and human choices may be changed. But, in normal conditions, human beings tend to follow rather predictable patterns, for instance exploiting the “easy” resources (those which are at the highest thermodynamic potential) and then move down to the more difficult ones. That generates the curve. Now, I could show you many examples of the tendency of real world systems to follow the bell shape curve. Let me show you just one; a recent graph recently made by Jean Laherrere. These are data for the world’s oil production. As you can see, there are irregularities and oscillations. But note how, from 2004 to 2013, we have been following the curve: we move on a predictable path. 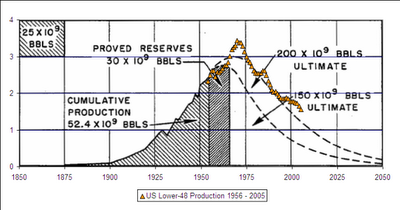 Already in 2004 we could have predicted what would have been today’s oil production. But, of course, there are other elements in this system. 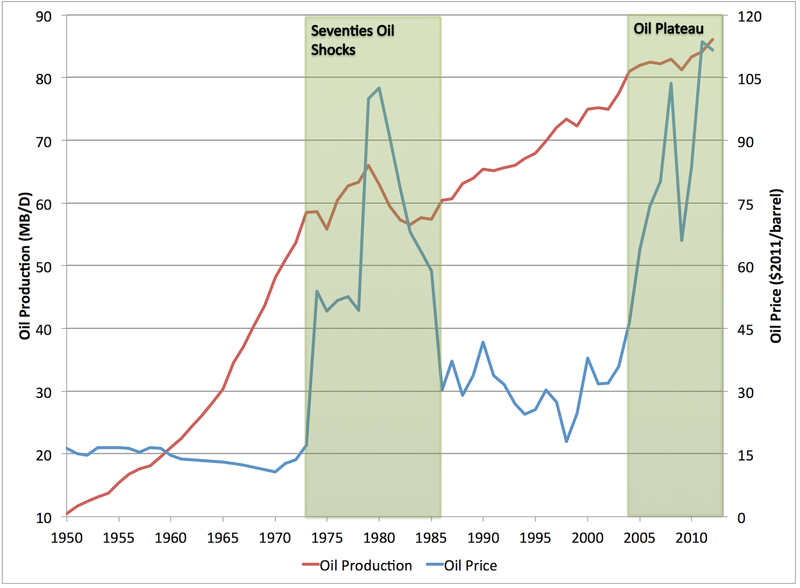 In the figure on the right, you can see also the appearance of the so-called “non-conventional” oil resources, which are following their own curve and which are keeping the production of combustible liquids (a concept slightly different from that of “crude oil) rather stable or slightly increasing. But, you see, the picture is clear and the predictive ability of these models is rather good even though, of course, approximate. You see? The data you usually read for petroleum production are just that: how much petroleum is being produced in terms of volume. There is already a problem with the fact that not all petroleums are the same in the sense of energy per unit volume, but the real question is the NET energy you get by subtracting the energy invested from the energy produced. And that, as you see, goes down rapidly as you move to more expensive and difficult resources. For EROEIs under about 20, the problem is significant and below about 10 it becomes serious. 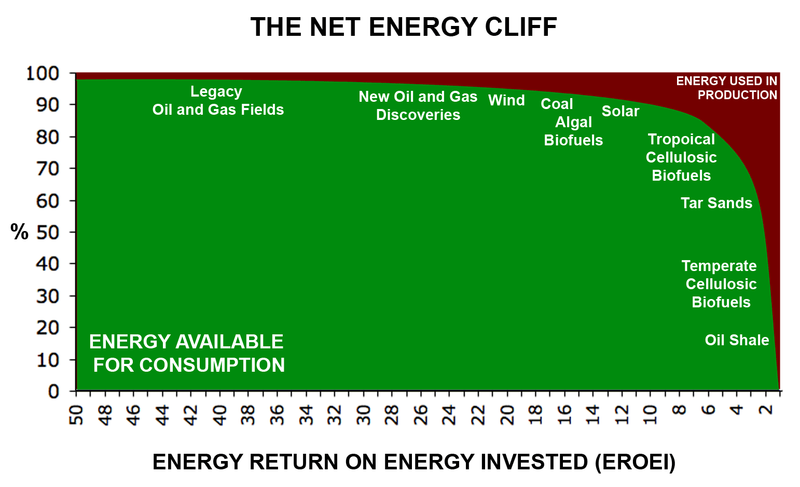 And, as you see, there are many energy resources that have this kind of low EROEI. So, don’t get impressed by the fact that oil production continues, slowly, to grow. Net energy is the problem and many things that are happening today in the world seem to be related to the fact that we are producing less and less net energy. In other words, we are paying more to produce the same. This appears in terms of high prices in the world market. Here is an illustration of how prices and production have varied during the past decades from the blog “Early Warning” kept by Stuart Staniford. And you see that, although we are able to manage a slightly growing production, we can do so only at increasingly high prices. 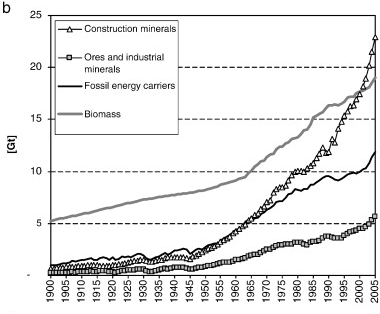 This is an effect of increasing energy investments in extracting difficult resources – energy costs money, after all. So, let me show you some data for resources that are not petroleum. 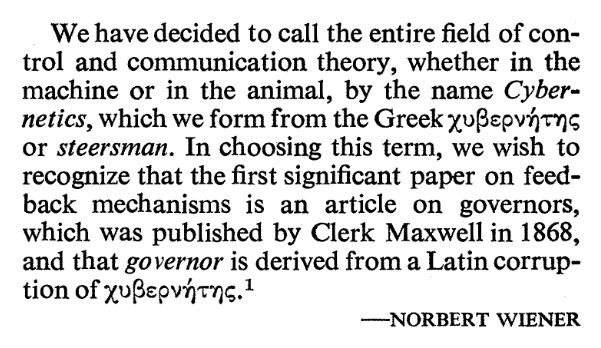 Of course, in this case you can’t speak in terms of ERoEI; because you are not producing energy. But the problem is the same, since you are using fossil fuels to produce most of the commodities that enter the industrial system, and that is valid also for agriculture. Here are some data. 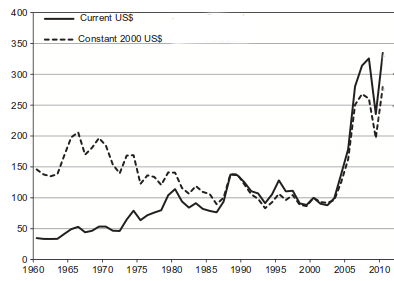 Food production worldwide is still increasing, but the high costs of fossil fuels are causing this increase in prices. And that’s a big problem because we all know that the food demand is highly inelastic – in plain words you need to eat or you die. Several recent events in the world, such as wars and revolutions in North Africa and Middle East have been related to these increases in food prices. So, you see, there has been this remarkable “bump” in the prices of everything and that correlates well with what I was arguing before: energy costs more and, at the same time, energy requirements are increasing because of ore depletion. At present, we are still able to keep production stable or even slowly increasing, but this is costing society tremendous sacrifices in terms of reducing social services, health care, pensions and all the rest. And, in addition, we risk destroying the planetary ecosystem because of climate change. Of course, many people say that we are so smart that we can invent new ways of mining that don’t require so much energy. 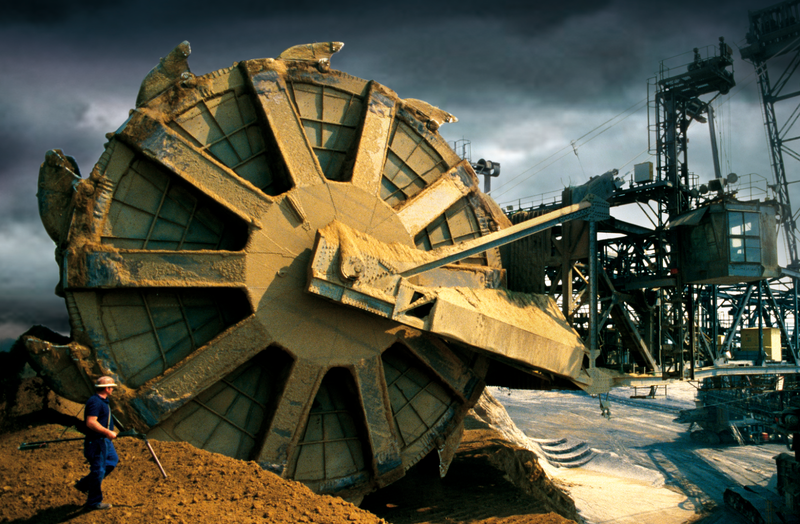 Fine, but look at that giant wheel, above, used to extract coal in the mine of Garzweiler in Germany. Think of how much energy you need to make that wheel; do you think you could use an i-pad, instead? Here, I use the German term “Energiewende” which stands for “Energy Transition”. And I have also slightly modified the words by Stanley Jevons, he was talking about coal, but the general concept of energy is the same. We need to go through the transition, otherwise, as Jevons said long ago, we’ll be forced to return to the “laborious poverty” of older times. Start your own projects. See our RESOURCES page. Facing limits to sun-powered renewable energy. Latest in a series. The sun showers the earth with more energy every hour than what civilization currently burns with fossil fuels every year. Given this tantalizing bounty many greens view the resource as cheap, clean, noiseless and limitless. Yet despite 50 years of solar innovation the industrial world currently runs on 17 terawatts of primary energy mostly provided by coal, gas and oil. Nevertheless many experts estimate that solar PV and thermal systems if planted on the world’s deserts occupying an area the size of Venezuela — could eventually create about 15 terawatts of energy within 50 years. In fact solar is the only renewable with the potential to challenge the dominance of hydrocarbons. Geography: The sun does not shine brightly or intensely everywhere. As a consequence it costs less to generate more power in places like sunny California than it does cloudy Germany or Ontario. Yet for political reasons much infrastructure has been built in cloudy developed nations with highs of energy spending combined with mediocre levels of radiation. Cheap oil has discouraged use of solar power in the Middle East. Materials: The making of solar photovoltaic cells requires rare elements such as gallium, tellurium, indium and selenium. Called “hitchhiker” metals, most are the byproduct of industrial copper, zinc or lead production. New thin-film solar sheets, for example, depend on indium. Moreover indium reserves are largely located in China and the U.S. Geological Survey predicts global supplies could be depleted within 10 years. Concentrated solar power which use mirrors to direct solar rays to heat water, also employs silver at rates of one gram per square meter. A global boom in such solar units would create silver shortages. Copper shortages are also a concern. Storage: Solar power offers intermittent bursts of energy, posing storage challenges. The average percentage of time a solar operation pours electricity onto the grid at full rated capacity ranges from 12 to 19 per cent. In contrast a coal-fired plant runs 70 to 90 per cent of the time. Storing sun-derived power in batteries, molten salts or compressed air schemes remains problematic if not costly due to significant energy losses in storage and release. Energy Density: Just as a slice of cheese offers more calories than a potato, different energy sources pack difference punches. The amount of energy contained in a solar ray versus a lump of coal is reflected in their respective geographical footprint. A 1,000 megawatt coal-fired plant requires 1 to 4 square km to mine and transport the coal. In contrast it takes 20 to 50 square km or the area of a small city to generate the same amount of energy from a photovoltaic farm. A large solar industry will compete with other land uses. That’s how Pedro Prieto, a 62-year-old global telecom engineer and solar entrepreneur, sums up Spain’s famous solar revolution. But the revolution rapidly collapsed into a messy economic bust that has left more questions than answers. Moreover, Prieto and his Spanish compatriots are still counting the unpredictable casualties of the nation’s stalled energy transition. Now the engineer is no stranger to solar power. As a telecom engineer he has worked with photovoltaic panels in remote locations since the 1970s. Nor is he a cheerleader for fossil fuels. As the co-founder of the Spanish Association for the Study of Energy Resources, Prieto has long advocated abandoning oil before its volatile pricing and pollution leave the globe in financial and atmospheric chaos. Since 2004 he has designed, consulted and helped to build more than 30 megawatts (MW) of solar photovoltaic (PV) plants. He even manages, operates and partially owns a PV plant that spills one megawatt of juice (enough to power up to 1,000 homes) onto the national electrical grid in the province of Extremadura. 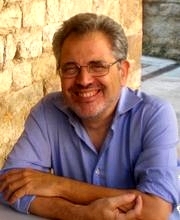 Given his vast technical experience Prieto also consults with governments around the world on solar renewable prospects. And he has also teamed up with ecologist Charles Hall to produce a provocative book: Spain’s Photovoltaic Revolution: The Energy Return on Investment. Prieto is also the sort of guy that practically beams out inconvenient statistics. In 2007 installed solar power amounted to .0006 of the world’s electrical consumption and did not keep pace with the growth of electric consumption. Spain, of course, has gained some fame and notoriety as a global solar pioneer. One-tenth in 2009 and one-fifteenth of the world’s installed solar power modules now dot the Spanish countryside. But these expansive operations provide but 4.3 per cent of Spain’s electricity. The sun’s sheer abundance has always made it the world’s most popular renewable form of energy. Of all green alternatives solar energy is the only one whose potential harvest far outstrips the demand for fossil fuels. Enough radiation hits the earth every hour to meet all of the world’s electrical needs for a year. By some very optimistic estimates the rapidly growing solar industry could account for 10 per cent of the world’s electrical production by 2020. And he’s not short of examples. The sun is renewable but photovoltaics are not. Just to make the silicon used to trap the sun’s rays on manufactured wafers requires the melting of silica rock at 3,000 Fahrenheit (1,649 Celsius). And the electricity of coal-fired plants or ultrapurified hydrogen obtained from fossil sources provide the heat to do that. It also takes a fantastic amount of oil to make concrete, glass and steel for solar modules. But Spain’s interest in renewables is no mystery. Not only does the world’s 14th economic power rely on fossil fuels more than any other European nation (consumption has doubled in the last decade), but it suffers from a 90 per cent dependency on foreign imports. Within short order farmers signed over orchards and plots of land for solar PV farms. Next came concentrated solar tower installations. Unlike Germany’s solar revolution, which planted thousands of modules on rooftops, Spain focused its solar growth on installed ground facilities. They are, says Prieto, much more efficient and easy to maintain. In response to the subsidies factories making silicon wafers and/or assembling modules popped up like orange trees across the nation. Sensing a financial killing, global banks and pension funds poured money into Spain’s solar boom the same way they funded financial derivatives or the shale gas revolution in North America. By 2008 Spain’s solar explosion eagerly swallowed half of the globe’s photovoltaic module production. Facing module shortages the country even started to import products from Germany, the U.S. and China. But by 2008 the excesses of the boom became readily apparent. For starters, the government realized that it could no longer subsidize renewables for 25 years to the tune of 2.5 billion Euros a year. And so it issued new royal decrees cutting promised returns from 46 cents a KW hour to 32 cents for investors. Later decrees forced more reductions putting brakes on the entire solar module industry. “There have been 15 royal decrees on renewables since 2004,” explains Prieto. “Each one tries to fix the unanticipated problems of the last one. Each one is worst than the last. But each decree makes renewables less credible.” A raft of lawsuits has predictably clogged the courts. An industry poised for a massive build-up based on guaranteed returns, explains Prieto, then laid off workers as a debt-heavy government cancelled or lowered promised financial returns from the sun. The solar PV sector now estimates that 44,000 of the nation’s 57,900 installations are on the verge of bankruptcy. During the solar “craziness” as Prieto calls it, other problems emerged too. Investors often planted installations of poor quality and design across the landscape. Many facilities weren’t even located in the sunniest parts of Spain. Spain’s renewable boom (wind installations now make up 17 per cent of Spain’s electricity supply with peaks covering up to 56 per cent) also created havoc with the nation’s energy balance. Government investment in natural gas fired plants (a backup for intermittent wind) combined with renewables resulted in overcapacity in the system. Even the nation’s nuclear power plants had to power down from 7.7 to 6.7 gigawatts for a while. But what troubled Prieto most were the paltry energy returns of some 57,900 solar plants, both big and small. He reviewed Spain’s excellent data on the energy outputs of the nation’s solar network and than compared those findings to actual energy inputs. To his dismay Prieto found that solar offered only slightly better returns than biofuels. Or 2.4 to one. His finding surprised many researchers and for good reason. Previous studies put solar returns as high as eight or even up to 30 to one in some cases, or almost on par with conventional oil. But most of this research used the same sort of best-case scenario modelling typically employed by car industry mileage studies. As long as the roads are flat, the fuel is good, the tires full and the driver competent, then great mileage can be achieved. But real life experience can be different for car mileage as well as the energy output for solar installations. Spain discovered, for example, that the earth is rarely flat (a big issue for tracking and directing solar rays in the right direction). Moreover the modules (only 15 per cent efficient on average) rarely perform as expected. Not only do the panels require regular maintenance but constant cleaning to remove films of dust. And they only last 25 years. Moreover countries such as Germany which receive but two-thirds of Spain’s sunlight in the best case and on average deploy much less inefficient rooftop arrays will probably have returns one-fifth to one-third lower than Spain. “Solar installations are dependent on a fossil fuel world and there are difficulties scaling up the power of the sun,” says Prieto. And what does Prieto think of big plans to industrialize the deserts of the U.S. southwest to provide power for the east? Or plans to colonize the Sahara desert of North Africa for European delights? Not much, he replies sadly. The engineer calculates that just one plan proposed by former French President Nicolas Sarkozy was so big that it was obsolete before it harvested one solar ray. The plan would have covered 400 sq. km of land and burned three to six million tons of coal to erect 1.8 to 3.6 million tons of steel and two to four million tons of glass. Vast amounts of clean water and lakes of desalinated water would have been needed to maintain the plants. Yet the plan would have generated only three per cent of the electricity that nations of the Mediterranean basin now consume. Such a scheme would exchange the political insecurity of oil and gas pipelines with high voltage cable lines. “It would be far more rational to strive for a world with far lower levels of more localized demand and widely distributed, small and local generation and distribution networks where possible,” the engineer concluded in a recent editorial. But the big issue for solar is simply scaling up the enterprise to capture enough of the sun’s rays to retire just a fraction of fossil fuels. Prieto calculates, for example, that to replace all electricity made by nuclear and fossil fuels in Spain would take a solar module complex covering 6,000 sq. km of the country at the cost the entire Spanish budget (1.2 billion Euros in 2007). It would also require the equivalent of 300 billion car batteries to store the energy for night-time use. Prieto is not alone in reaching such sobering conclusions. A 2013 Stanford University report, for example, calculated that global photovoltaic industry now requires more electricity to make silicon wafers and solar troughs than it actually produces in return. Since 2000 the industry consumed 75 per cent more energy than it put onto the grid and all during its manufacturing and installation process. Moreover it won’t pay off this energy debt or energy consumed in its construction until 2016. As a consequence, ramping up of industrial solar production produces more greenhouse gases than it saves for nearly a decade. The study also recommended that reducing the fossil fuel inputs for a next generation of photovoltaic systems be a key priority. In Spain where nearly a quarter of the workforce sits idle and political unrest smolders in the cities, there is much talk about “La vida buena” or what the French call “decroissance” or degrowth. The grassroots movement is all about living better by consuming less and sharing more. Prieto suspects the future may be determined more by behavior change than by investments in renewables. “In general terms, I would suggest we make every possible effort to move towards a lower consumption and lower mobility society,” sums up the 62-year-old. When asked for advice on what other nations should do, Prieto thoughtfully pauses. It’s the nett energy stupid…..
Another stinker (must be at least 37° again today), and it looks like another storm in the offing. In the end, we only got 26mm last night, more lightning than rain…. but all donations gratefully accepted! There’s so much hype these days about how America will become energy self sufficient because of all the shale deposits being mined. It’s hard to explain to people new to the energy cliff exactly how much difference good and bad ERoEI makes to the running of our civilisation. Everything, not least the maintenance of all the stuff that is already here, relies on available surplus energy to keep our living arrangements humming. Before we discovered energy dense oil and coal and how to exploit it to the max, everything was done by hand. Or hoof. I always have to laugh when people say to me it’s impossible to run society on 100% renewable energy. Exactly how do they think we got to here before oil and coal were exploited to death? Magic? Yes my friends, 200 years ago, everything ran on renewables…. biomass for food and firewood, wind and water for power to grind grains, and biomass powered by solar energy. It’s very obvious with just a cursory glance at this why the industrial revolution was so successful. With coal at 80:1 and the oil discovered prior to the 1930′s at 100:1, who in their right mind would do heavy work with muscle power? The jump to less than half that in the next three bars, hydroelectricity and post US Peak petroleum, also clearly shows why there was an energy crunch in 1973 and 1980. All of a sudden, some 50% of all surplus energy disappeared….. and it all had to be replaced with ever more imported oil (at least in the US, by far the biggest economy of the time). But what really caught my eye was the bar for firewood…….. Firewood has today the same ERoEI as imported oil in 2005, the largely accepted year global Peak Oil occurred…! I cannot wait for the next time some clot starts sparring with me on some ABC forum about my firewood habits; I’ll be able to tell him that firewood is more efficient than NUCLEAR…! That’s so amazing, even I have difficulty believing it. Except of course that firewood is used exclusively to generate heat, unlike electricity, an energy source that is unequalled for running computers, lights, TVs and charging your iGadgets, but terrible for making heat…. When you think of how electric heat is made, by burning a fossil fuel a long way away to heat water up and make steam to drive a turbine that drives a generator, and feeding the resulting electricity down some long wires, through 1, 2 and sometimes 3 transformers to your house where you re convert it to heat is complete stupidity. Compare that to using a gas stove where the fossil fuel is lit directly under the saucepan, and it’s a no brainer as to which method is best. Enter firewood, which is renewable (it grows on trees!) and, if sustainably replanted, is also Carbon neutral, and yes I can see why firewood has such a high ERoEI. Just don’t expect to run your laptop off it. Anyhow, this chart doesn’t have a bar for shale oil, but I expect if there was, it would be right next to the tar sands one….. The future will not run on shale oil and tar sands, those two terrible fuels are only possible while we still have that good stuff from before 2005…… and after that? Better start planting lots and lots of trees.